Surrey Lifelong Learning Partnership has runs a number of job workshops, most recently in Old Dean (Camberley), Epsom Town Centre, Dorking, Redhill and Maybury and Sheerwater. This has been meeting on Wednesdays between 12.30 and 2.30 pm at the Maybury Centre. It advertises support with writing a CV, finding out about barriers that hold you back, breaking into the hidden job market, using the internet for job searches, learning interview skills and techniques, and computer training. The Surrey Lifelong Learning Partnership has helped it first to survive and then to flourish by finding new forms of funding. The Club provides opportunities for job seekers to receive information, advice and guidance, to develop action plans, to undertake training, to develop IT skills, to receive training in other pre-employment skills and to have access to information, support and resources to help find work, volunteer or engage in further training. People can be referred by Job Centre Plus. Corner House, a mental health facility run by Woking MIND, and the Children’s Centre also refer people. Surrey Lifelong Learning Partnership co-ordinates the Club and three facilitators attend: one to assist digital inclusion, the second as a career coach and a third from the National Careers Service to run workshops on CV writing, interview skills and the hidden jobs market. The Club is attended by between 15 and 20 people who drop in or attend regularly. The trainers model the qualities that people will need to have if they are to gain employment: dressing smartly, being punctual and finishing at a set time. On first walking through the door, the client is greeted by the Co-ordinator and asked a few questions before being introduced to how the Club can help. By meeting one of the advisers an initial assessment takes place and an agreed plan of action written. It is important to help the newcomer to relax and have a chance to explain how they are feeling, what their experience and skills are and what aspects they need training in. The assessment always focuses on learning need. Apart from the workshops, the help is given on a one-to-one basis. The co-ordinators and advisers make sure that everyone attending gets their share of attention. There are always delicate matters to address: for example, time management, appropriate dress for work, difficulties with basic skills, helping people who have moved off Disability Living Allowance or Employment Support Allowance onto Jobseekers’ Allowance. It is important to bring in relevant partner organisations for support as well as additional learning elsewhere. The Club works with the local shopping centre to get interview practice when applying for retail posts. Cases are reviewed and plans of action are changed to match the circumstances, particularly when a person has not attended sessions or when a person has been coming a long time and needs to re-focus. Clients are followed-up to map progression routes and to see whether they need further support. Sometimes the Club undertakes outreach sessions where groups are known to be nervous or hesitant about seeking help: a good example, is with Cornerhouse, a mental health facility that helps to breakdown isolation and lack of confidence among Asian women. Elaine, who manages the project says, “A major challenge is tackling the negative feelings people have based on past failures in learning. It is as if they do not have the confidence to be adult in a situation that reminds them of being a child.” The tutors are friendly and empathetic but they expect their clients to take responsibility. It is a fine line to draw. The tutors are there to support people in solving employment and learning problems for themselves. 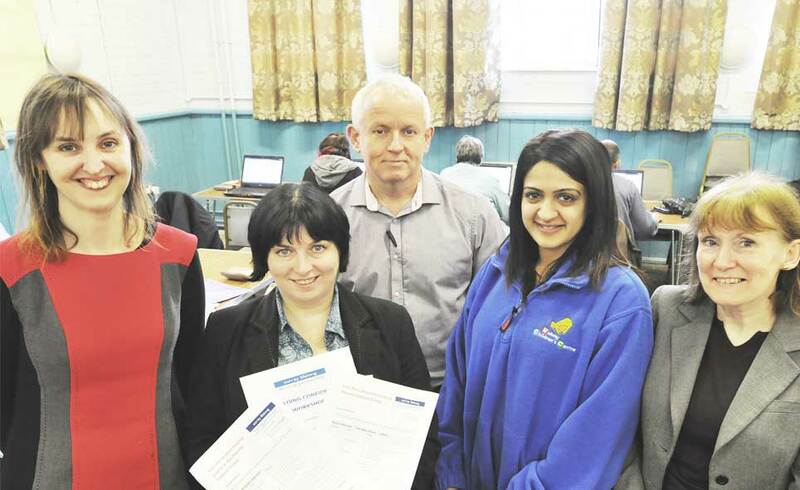 The Maybury and Sheerwater Job Club has been very successful at moving people on, so that they are willing and able to take tailored learning programmes and build up their confidence and skills in order to take their place in the job market. With encouragement, the clients have set up a Friendship Group outside of the Job Club which they run in order to support each other and cover other life skills not necessarily directly linked to Job Searching.